Microsoft Excel Spreadsheets and Structural Engineering Calculators. The concrete Beam Spreadsheet is useful to calculate reinforcements, as well as short and long term deflection check. Fill the yellow cells as required. Pole Foundation is based on Florida Building Code, Chapter 16. You may change the confinement pull-down menu, if the top of foundation is confined by concrete slab. Spread footing and combined footing spreadsheets are provided here. Wood rafters can be sized by using this spreadsheet. Fill the yellow fields, as required. C coefficient shall be used to modify the Fb allowable stress. Flectural allowable stress ( Fb ) for Southern Pine #2 are 1500 Psi for 4" member, 1250 Psi for 6" member, 1200 Psi for 8" member, 1050 Psi for 10" member and 975 Psi for 12" member. Those figure shall be simultaneously multiplied by Cm for moisture, Cr for reputation, etc. The new code ASCE 7-10 has been enforced in Florida as of 3/15/2012. 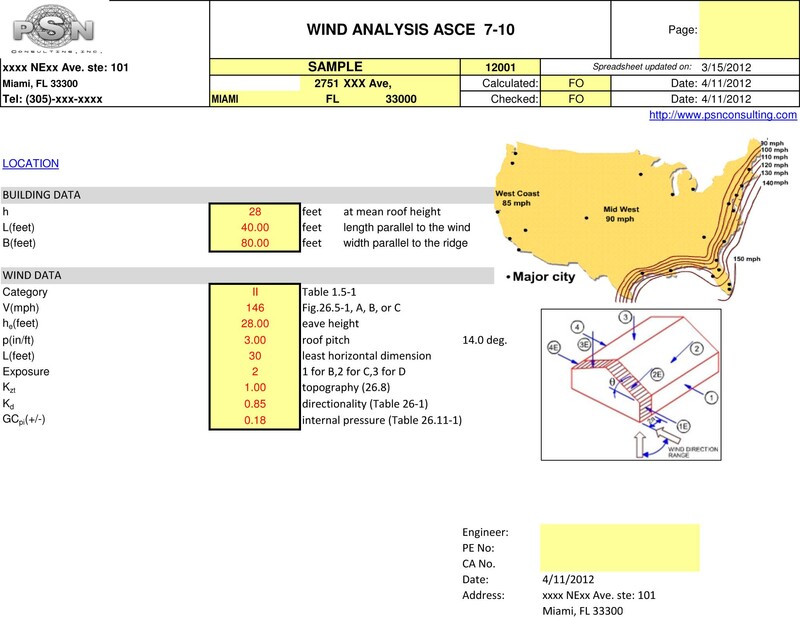 You may find below the new spreadsheet for ASCE 7-10 for roof pressures, parapet, wall-window pressures. Spread or combined footings are the member sof structure to distribute the concentric column load over soil in a way that the allowable soil resistance (load carrying capacity) does not exceed. The spread sheets given here is only for one-way moment applied footings.